McMath Controls stocks Graco Barrel Pumps in our Edmonton warehouse. 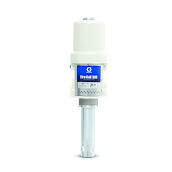 Graco Barrel Pumps provide a double acting pump which provides reliable fluid flow. The differential air motor ensures smooth pumping regardless of your application or fluid. The typical fluids used in the Graco Barrel pumps are petroleum and synthetic based oils. Graco Barrel Pumps can be used in the following applications: lubricant transfer, automotive dealerships, heavy duty dealerships, fast lube centers and in fleet service facilities.